Well, it’s that time of the year again. Fans everywhere are running across better and better pictures of upcoming sets. Eurobricks is famous (dare I say notorious?) for finding leaked pictures, and this latest batch is no exception. Trolls in brown and green. Two new helmets for the goblins and two more for the dwarfs. A new sword for the goblins and a new club for the trolls. Two new beard designs for the dwarfs. One word. Sweet. well, thats three… I think to much. 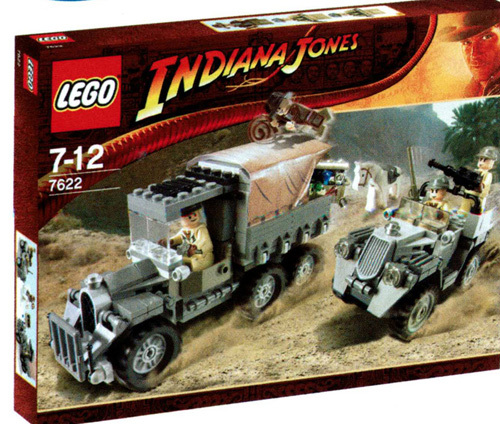 Wow, I like those Indiana Jones trucks. Set 7036 is using prototype colours, and mixed parts being used for the colour that has not been made for certain parts. Set 7036 will most likely have slight changes to it. Note the hands on the green guys they are still yellow. Green faces do not match set 7048. Set 7048 is the real thing, background colours are set to official Lego standards for lighting and hue ( the light blue and white dot spaced picture fading ) but set 7036 has brown lighting which Lego company avoids when prinitng product catalogs. However, brown and green tinges are used in the free lego magazine so picture 7036 could be from this before final edit with proper images. 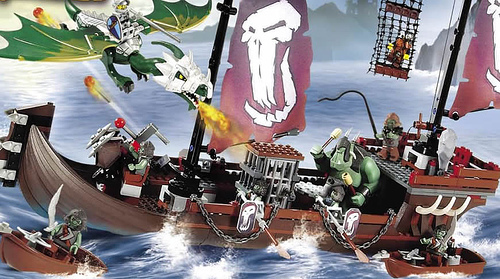 Lego company trys to save costs so they will have big ork and little orks using same dye lot instead of as seen in set 7036 different green for big ork, different green for little ork and different green that is not used in any other piece in the set as containers for holding the gold. To save money this green would be used in other areas, or also to Coordinate in building alternative models. But, sometimes this rule does not apply such as a signature set like starwars which does nor follow this pattern as much. However, I Admit everything I just typed could be wrong!!! Holy crap! DO WANT! DO WANT! It seems as though most pictures on boxes or online and in magazines are either enhanced or digitally composed. i think this gives them a megablock *shudder shudder* look to them. I like the fantasy style of this year’s Castle sets, but I agree that many of the new pieces look Megablockish — especially the orcish swords and the winged dwarf helms. The trolls are pretty nifty, and it looks like there’s now round crown shields. A single design with small-hole plume wings would’ve been beautiful. I find it very odd that Lego has made so many new pieces for this Castle theme, and didn’t want beards in the Viking theme. I like this year’s Castle sets, I do not like next years, they look odd, there are too few humans and no skellies. The boat is awesome through. IJ sets looks great, I want to see the City sets. any chance that there will be smaller lower priced sets? Ian what theme are you talking about? These is a small Castle set that looks like this years catapult so that will be $10ish. 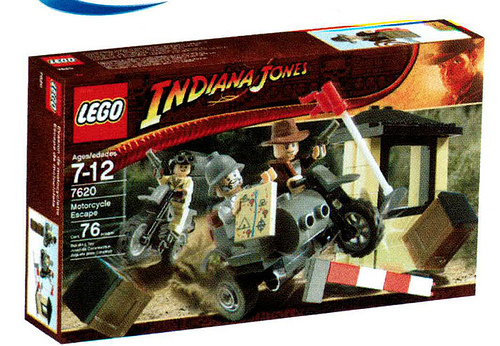 The Indiana Jones motorbikes set is $10. 7668 will most likely be $10 – to $15. Would love to know there dates on release! WOW! THERE COOL! Awesome sets! 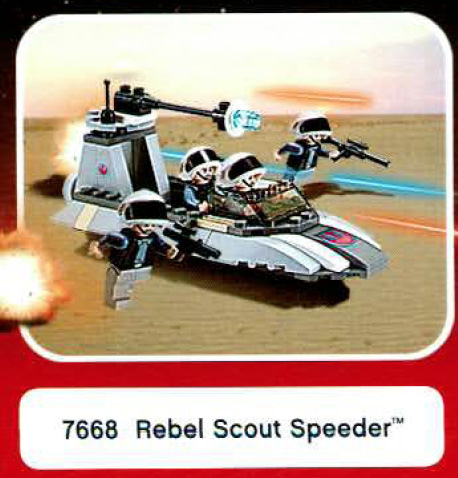 i want the rebel speeder! Any idea how much 7048 will cost? I’m a fan of the Castle theme (especially the dragons). 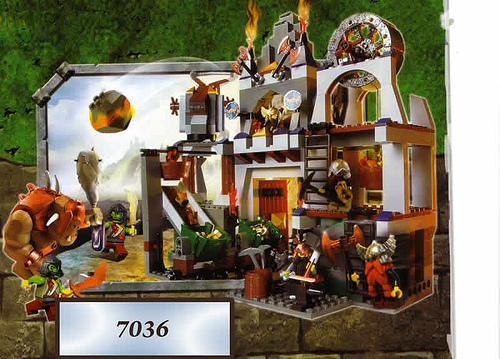 The only other two with dragons are 7094 and 7093, and they were a bit expensive. Does anyone know how much 7048 will be? Victoria, assuming that the ship is priced at about the same amount as the Viking long ship, it’s probably going to be around USD 50.00. Then again, if it’s priced around the same as 7029 Skeleton Ship Attack, it could be as much as USD 70.00. To Dunechaser – thank you!